The British High Commission in Mozambique is located in the city of Maputo. If you are in Mozambique and need consular assistance such a registering a child born abroad of having document certified then you can speak to the staff in Maputo. We have listed the details below for the High Commission in Mozambique. If you have lost your passport then you can also ask about renewing your passport of apply for a British passport while in Mozambique. 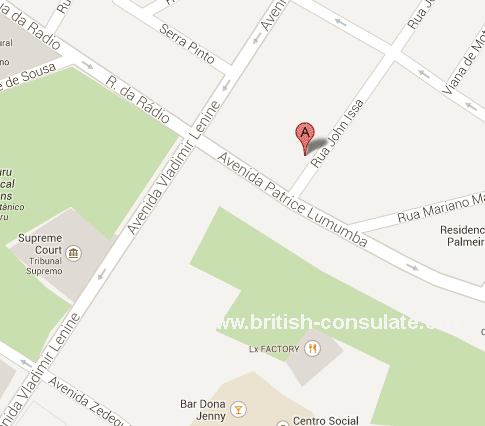 The contact details are listed below with a map to the British High Commission in Mozambique. If you are wanting to visit the UK then you can apply for a visitors visa or if you are married to a British citizen then you can apply for a spouse visa or fiancee visa for the UK. Contact the High Commission as listed below. note that the British High Commission is close to the High Court in Maputo.